Welcome to day 10 of my Countdown To Christmas Cookie Recipes. Today’s recipe is for Candy Cane Cookies. Tomorrow’s recipe is for Cinnamon & Caramel Cookies. Preheat the oven to 180°C/350°F/Gas 4. Grease 3 baking sheets. Sift the flour and bicarbonate of soda together in a bowl. Add the butter and rub into the flour until the mixture resembles fine breadcrumbs, then stir in the brown sugar. In another bowl, beat together the egg, vanilla extract and golden syrup with a fork. Pour this mixture into the flour blend and stir to make with a smooth dough, kneading lightly with your hands. 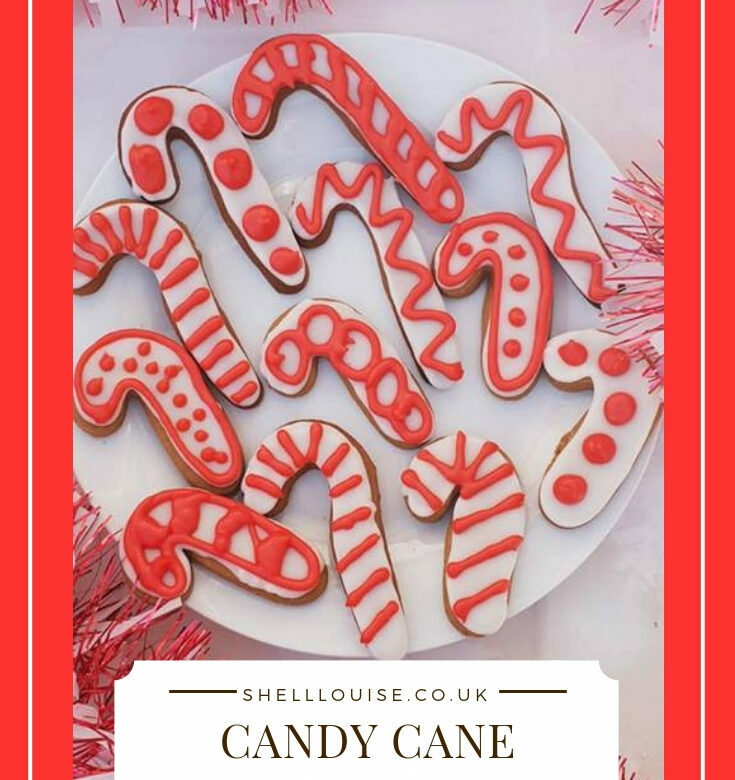 Roll the dough out on a lightly floured work surface to about 5mm thick and cut into shapes using a candy cane shaped cutter. Transfer the cookies to the prepared baking sheets and bake in the preheated oven for 10 minutes until golden brown. Remove from the oven and allow to cool for 5 minutes before transferring, using a palette knife, to a wire rack to cool completely. Once the cookies are cool, mix together 280g of the icing sugar and 75ml f the lemon juice until smooth. Spoon the mixture into the piping bag fitted a very fine nozzle and pipe icing around the edge of the cookies. Empty any remaining icing into a small bowl, colour it with the red food colouring and cover with clingfilm. Mix the remaining icing sugar with the remaining lemon juice until smooth and runny. Spoon this into the centre of each cookie and encourage it to the piped edge to flood each biscuit. Allow to set overnight. Spoon the red icing into a piping bag fitted with a very fine nozzle and pipe stripes, dots and twirls over the dry iced cookies.